Learn Spanish and dance! Salsa, Flamenco or Tango courses in Spain or Latin America. StudyTravel offers you the opportunity to not only learn Spanish in Spain or Latin America, but also take a Salsa, Flamenco or Tango dance course alongside your Spanish lessons. Choosing to learn Salsa, Flamenco or Tango in Spain or Latin America, is not only a lot of fun, it also helps you improve your Spanish language skills! The language & dance courses are offered in Alicante, Madrid, Málaga, Marbella, Vejer, Nerja, and Granada. Madrid is an artistic, cultural and colorful city and the perfect place to learn Spanish and Flamenco. The vibrancy of Madrid invites you to feel the heartbeat of Spain through the Flamenco dance rhythm. 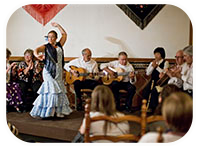 You can also learn Spanish and Flamenco in Marbella, a luxury resort situated on the Costa del Sol. The art of flamenco combines acoustic guitar playing, singing, dancing and staccato handclapping to transmit the joys of life itself. The Spanish and Flamenco course in Marbella consists of 20 hours of Spanish lessons per week and 10 hours of Flamenco lessons per week. In Malaga we offer you the opportunity to learn Spanish, Salsa and Sevillanas. The Spanish and dance course in Malaga consists of 2 dance lessons (salsa or sevillanas) and 4 Spanish lessons each day. You can also take a Spanish and Dance course in one of our destinations in Latin America: in Havana, Oaxaca, Playa del Carmen, Santiago de Cuba, Trinidad, or Buenos Aires. Havana and Santiago de Cuba are Cuba´s two largest and most impressive cities, which both contain world’s best literature, music and politics. In these magnificent global metropolises you can combine a Spanish language course with one hour per day of private dance lessons. The typical Latin dances our schools can teach are: Salsa, Mambo, Rumba and Son, depending on your interest and level. For prices and dates of departure look at the following links for the destinations Havana, Trinidad or Santiago de Cuba. Buenos Aires with its countless bars, cafes and beautiful neighborhood is renowned for being the city of "Tango and Romance". Our contracted school offers you an intensive Spanish course and two additional private tango lessons with fully qualified instructors. To find out more on the course and the city follow this link: Buenos Aires. In addition to the intensive Spanish language course you can combine salsa classes. For more information on Spanish and dance in Mexico click here: Playa del Carmen or Oaxaca.